Once you have learned a basic Taiji form, whether you study Yang, Chen, or another style, there is still a great deal that traditional Taijiquan training can offer. Once you have learned a basic Taiji (Tai Chi) form, whether you study Yang, Chen, or another style, there is still a great deal that traditional Taijiquan (Tai chi Chuan) training can offer. Taiji Stationary Pushing Hands (太極定步推手, Taiji Ding Bu Tui Shou) trains you to develop sensitive feeling, or “Listening Jin” (Ting Jin, 聽勁) to sense your opponent’s intention, understand their Jin (勁)(power), neutralize it, and then counterattack. Pushing Hands specializes in teaching the student how to emit power (Fa Jin, 發勁) and also how to neutralize the coming power (Hua Jin, 化勁). It includes solo and partner practice. The purpose of Taiji pushing hands training is the same as that of the fighting forms in the external styles. However, Taijiquan emphasizes sensitivity to touch, or listening (Ting, 聽), understanding (Dong, 懂), following (Sui, 隨), attaching (Zhan, 沾), and adhering (Nian, 粘). In stationary pushing hands you must learn many fundamental techniques, such as single pushing hands and double pushing hands. These incorporate the energies of wardoff (Peng, ), rollback (Lu, ), press/squeeze(Ji, 擠), push/press down (An, 按), pluck (Cai, 採), rend/split (Lie, ), elbow (Zhou, 肘), and bump (Kao, 靠). In addition, other advanced pushing techniques, such as coiling (Chan, 纏), controlling (Na, 拿), borrowing (Jie, 借), leading (Yin, 引), and neutralizing (Hua, ) Jins are trained. In stationary pushing hands training, there are four basic neutralization patterns which a pushing hands beginner must learn. Next, he/she will begin double pushing hands training, which includes six different training patterns. Normally, these trainings are used to introduce four basic Taiji Jin patterns: Peng, Lu, Ji, and An. Next, a student must learn the other four basic Taiji Jin patterns, Cai, Lie, Zhou, and Kao. These routines are commonly called "Da Lu" (Da Lu, 大 , "Lu-Ji, 擠", and simply "Cai, Lie, Zhou, and Kao." Silk Reeling Taiji Symbol Training (太極圈纏手練習, Taiji Quan Chan Shou Lian Xi) is the foundation of the Taiji Pushing Hands and Sparring. This training includes two portions: the Yang symbol and the Yin symbol. A student starts with Yang symbol, solo practice first, then with a partner. Begin with stationary practice, then move to forward and backward. After a student is able to move forward and backward with closed eyes, he or she then starts the parallel walking training. Finally, he or she will complete this symbol with the Bagua walking. When a student has mastered the Yang side, then he or she should learn the Yin side and follow the same training procedures. When these two Yin and Yang symbols are mastered, a student will be able to change his or her techniques smoothly and easily and apply them in the Pushing Hands or Sparring. The ancient art of Silk Reeling Jin in Chen style Taijiquan is also known as Taiji Yin/Yang Symbol Sticking Hands in Yang style Taiji. The main purpose of this soft and flowing training is to ‘connect’ the body, from head to toe, so that you may coordinate your movements effectively. From this Yang-side and Yin-side training, a practitioner will establish a firm foundation for understanding the martial aspects of Taijiquan practice. Taiji Moving Pushing Hands (太極動步推手, Taiji Dong Bu Tui Shou) is the training before Taiji sparring, the final goal of instruction. In moving pushing hands, the student must use stepping strategy with the techniques learned in stationary pushing hands and the Taiji Fighting set. Students who have reached the level where the opponent cannot set them up, and can use their own techniques skillfully, have completed the basic training for sparring. 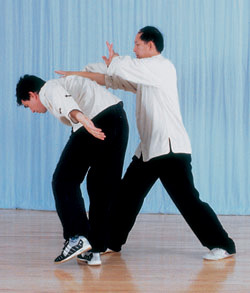 The Taiji Fighting Set (太極散手對練, Taiji San Shou Tui Lian) was designed so that two people could practice together in a situation resembling actual fighting. The main purpose of this training is to teach the student how to step and move his/her body into the most advantageous position in combat. Naturally, it also teaches the student how to avoid being channeled into a disadvantageous situation. The student needs to have practiced stationary pushing hands first, so that he/she can combine that experience with the fighting set to make the techniques come alive. Pushing Hands, Sticking Hands, and the Fighting Set can all be practiced for health purposes only, and they have many benefits for your general fitness, balance, and body awareness. However, the traditional purpose of Taijiquan is for fighting and self defense. Taiji Free Sparring (太極自由散手對打, Taiji Zi You San Shou Dui Da) is the stage of training where the student uses the techniques learned over months and years of training in actual hand to hand combat. Pads are worn are care is taken to not injure your training partner. As with most other Chinese martial arts, Taijiquan also includes weapons training, including the Saber, Staff, Spear, and Sword, as well as other lesser-known traditional weapons. Each of these fascinating weapons can take many months and years of study and training to master, and this again has many benefits for your body and mind. The path of traditional Taijiquan is not easy, but the rewards it offers are endless.